We had a family gathering last weekend and I wanted to cook a no fuss meal that would literally cook itself freeing me up to enjoy my guest’s company. So while we all sipped on our Aperol with Prosecco – a drink that I was introduced to this summer when we at our friend’s wedding in South Tyrol (and which has apparently become very in vogue in London this summer!) and caught up on each others news, the chicken and vegetables were nicely roasting in the oven without any need for stirring or turning over. I paired them with good old roast potatoes (that I had parboiled first and then drained and given a good shake in the saucepan before putting them on a roasting dish with a splash or two of olive oil) that are always a home run at a family occasion. Couscous would work equally well or even mashed potato. The saltiness from the black olives and the sweetness from the peppers and leeks worked a treat and together they created a delicious gravy to pour over the succulent meat and roast spuds. I love it when guests can help themselves to what they want as this tends to avoid wastage as they only take what they are going to eat and also it’s a fun and relaxing way to all share a meal together. I chopped (no carving here) the chicken up so that there were lots of options on what meat they could dig into. Around the side I scattered the leeks, peppers and black olives and in a separate gravy jug I gathered all the juices. With the remaining two carcasses I made some homemade stock, which I then turned into a delicious chicken soup for lunch the followingday. Easy, healthy and no wastage – other than the bones. 1. Prepare the peppers and scatter them on a large roasting tray along with the leeks, which should be cut to 3 inches in length and then halved. Evenly spread the black olives over the vegetables along with two sprigs of fresh rosemary. 2. Take off any string on the chickens and place a whole lemon – cut in two, into the inside of each chicken along with two rosemary springs in each. 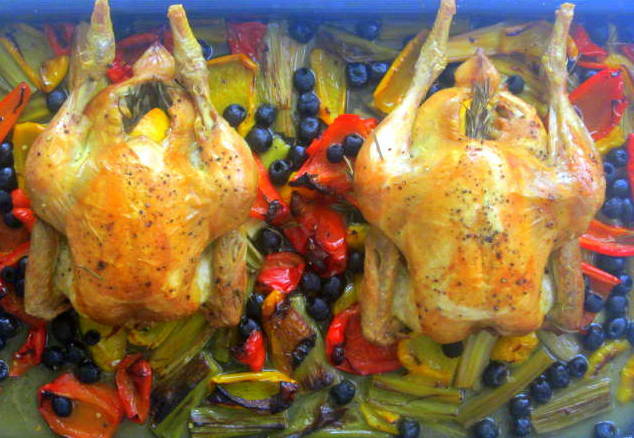 Season with pepper and salt and splash the chickens and vegetables liberally with olive oil. 3. Place in a preheated oven at 180 degrees if using a fan oven (200 degrees if not!) for approximately 1 hour 15 minutes – or until the chickens are bronzed and roasted and the juices are running clear when you cut into the chicken with a sharp knife. 4. 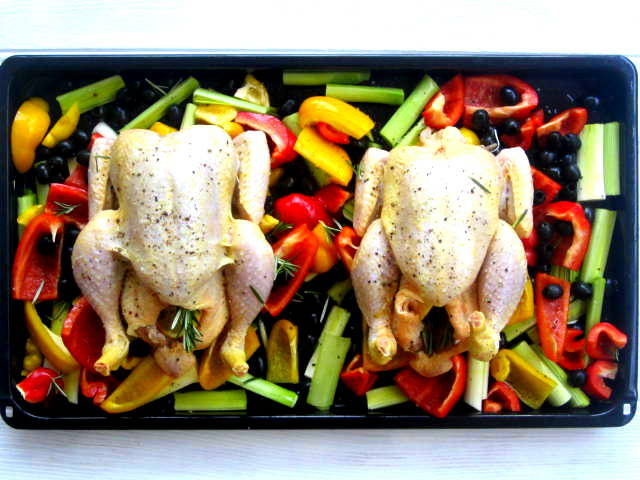 Serve on a warm large platter with the chickens cut up in the centre and the vegetables and olives surrounding the meat so that your guests can help themselves. 5. There will be a good amount of juices left in the roasting dish, which you need to transfer to a gravy dish for people to pour over their food. I served mine with roasted potatoes however, couscous or mashed potato would work equally well. 1. Place the chicken carcasses in a large pot and cover with water. 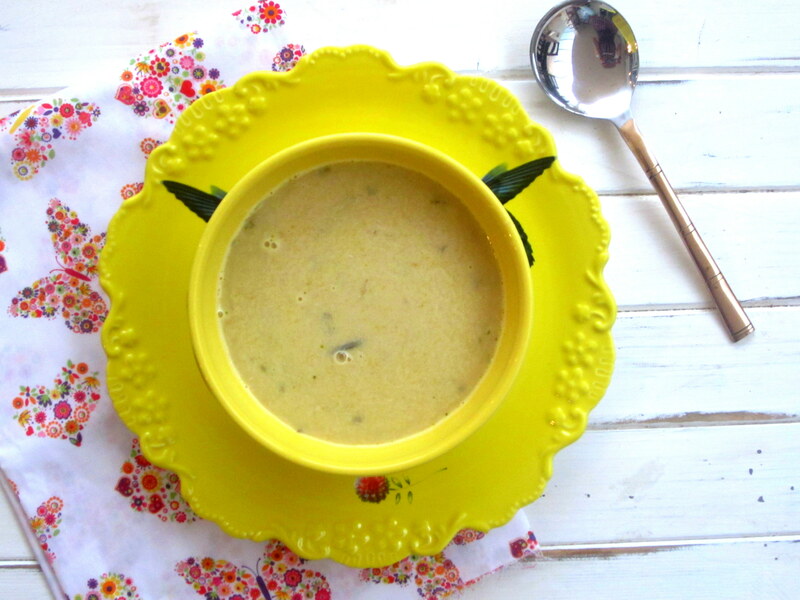 Make sure that there are no lemons remaining within the chicken carcasses when you are making the stock. 2. Add the carrot, onion, bay leaves and wine to the pot and simmer gently for an hour and then set aside to cool. 3. Strain the liquid through a sieve and return to the pot along with the carrot and onion. Place the chicken carcasses on the side and remove all the remaining meat with your hands and place into the pot. The meat with easily come away from all the bones. Bits of rosemary will also be on some of the meat from when you first roasted it. Add this to the pot as well as it adds a lovely taste to the soup. 4. Gently heat up the liquid once again and add the single cream, one chicken stock cube (optional), juice from half a lemon, some more water if you want it to go further. Season to taste. 5. Using a hand blender, blend the liquid until it is smooth. 6. Serve piping hot with a quarter of lemon on the side should guests which to add a little more lemon and some crusty bread. 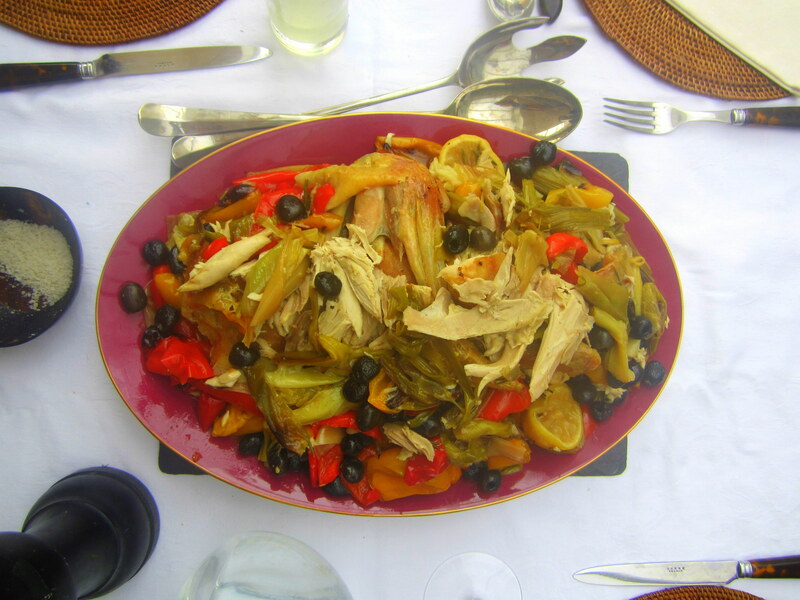 This entry was posted in Chicken, leftovers, Soup and tagged black olives, chicken soup, family occasions, leeks, leftovers, nigella lawson, Nigellissima, peppers, roast chicken, soup. Bookmark the permalink. Tried the chicken soup last night. It’s truly excellent! I added some tarragon and white pepper in addition to the ingredients you described. Thanks, Torie. Let’s meet up after half term. I have some Hungarian paprika powder for you. Yum, that chicken looks perfectly roasted!